I was taught to cultivate empathy and compassion by trying to understand other peoples’ experiences based on my own. This strategy makes a lot of sense to me as an ongoing process, and Jane Elliot’s blue-eyed/brown-eyed experiment titled A Class Divided comes to mind as a perfect example of why “putting yourself in someone else’s shoes” is a good idea. But used shallowly and in passing, this tactic falls short. When someone says “I just had the worst headache too,” I do entertain the possibility that their headache was just as disabling as my migraine attack, but sometimes I wonder if they think I’m a wuss when I cancel plans to lie about in sweatpants or if they think that migraine pain is merely a distraction or irritant (which, maybe it can be for some). The “headache” label also seems to be the norm in medical communities where the far-reaching, disabling, depressing effects of chronic migraine are definitely understood. 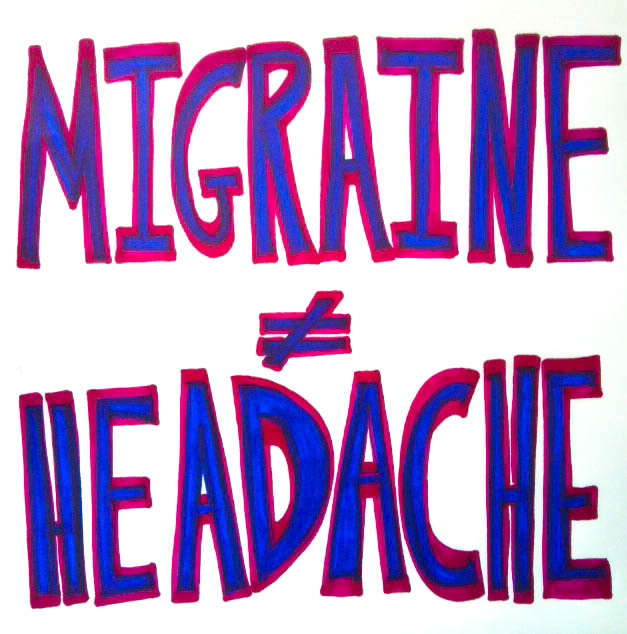 Migraine symptoms do not always involve head pain. A migraine attack can express itself as any combination of nausea, visual disturbances, sensitivity to light (photophobia), sensitivity to sound (phonophobia), magnified smells, yucky tactile sensations (think bras turning into boa constrictors), muscle aches and weakness, chest pain, and abdominal pain among other things. Essentially, it is the nervous system going haywire. Burning, throbbing, searing, aching, shooting, tingling, sharp, and tingling don’t even come close to describing the dynamic sensations that ensue. To try and describe last night’s attack, for instance, I might say that every cell in my body turned into an electrified whipper snipper while I sank rapidly into the pit of despair, and that’s the best I can do. If someone tells me they have a bad headache, I can offer sympathy, water, ice, or quiet, but I can’t say I know what they’re experiencing, because a) I’ve had very few non-migrainous headaches in my life, and can’t say that I even remember quite what they feel like, and b) there are probably infinite ways to experience pain, and we generally don’t have the dexterity in spoken word to express it. No “universal scale” or number of eloquent metaphors would allow me to understand, precisely, what they are experiencing. Perhaps a better way to cultivate compassion and empathy for someone in physical or emotional pain is to recognize that their experience might be outside of our realm of understanding. Perhaps our knee-jerk reaction to suggest solutions and relate is not always helpful for people in distress. Perhaps in lots of cases, a simple “I’m sorry to hear that,” or, “is there anything I can do for you?” or “what do you need?” followed by some active listening will do. If all else fails, make a nest: http://www.robot-hugs.com/nest/. I’m reminded of Shirley Valentine speaking of her neighbour: “I’m not sayin’ she’s a bragger, but if you’ve been to Paradise, she’s got a season ticket. She’s that type, Gillian, you know. If you’ve got a headache, she’s got a brain tumor.” I’d rather be a stellar nest-maker. I have just had first hand experience of people not being able to comprehend that migraine is not just a bad headache. On Sunday I was taken by ambulance to hospital for what was for me a reasonably common migraine. Although the pain was somewhat stronger than I usually experience, it was no where near the worst. However the usual symptoms of photophobia and phonophobia and a loss of language, cognitive and executive skills, meant that I was not able to explain what I was experiencing in a meaningful way. The Accident and Emergency department of a hospital are the last place someone with a migraine needs to be, particularly if you are also an Aspie. Talk about sensual overload! The bright lights and continuous noise can only be described as extreme level of cruelty. You’d think that someone would recognise that the reason I spent the entire 28 hours there with my fingers pressed firmly into my ears and a pillow over my head, was because I was suffering and do something about it. All they did was note on my discharge notes that I “appeared to be photo and phono sensitive”. Really? I notice that the discharge notes also says I was uncooperative as I “refused to answer questions fully”. Being unable to answer in any more than one word sentences does not mean I want to be uncooperative. It means I’m unable to string a sentence together. Likewise, the inability to give describe the pain on a scale of 0 to 10 is because I can’t comprehend the scale. It’s not because I’m being deliberately difficult. I can tell you I’ve got “pain” or “bad pain”. Anything more is beyond my ability. Even worse: A doctor (I think it was a doctor) asked me if I knew why I was in hospital, I answered truthfully “No”. The migraine didn’t seem to be any worse than others I get several times a month and I had no idea why an ambulance had been called. The notes record that “the patient cannot explain how he arrived at A&E or why he was admitted.” Huh? That wasn’t the question! There are a number of other entries in the notes describing me as being uncooperative. But I think what I have described is sufficient. Please excuse my rant. I’m extremely annoyed at the moment. The whole experience was nothing less than torture and will add days to my recovery. I suppose looking on the bright side, is that I’m unlikely to go through the same experience for at least 6 months and perhaps as long as 12 months. That’s been the pattern for that last 5 years. A request to all emergency personnel: Please, please do a refresher course on what a migraine is. It is NOT just a bad headache. It’s astounding how little medical professionals know about symptoms and treatment. I guess invisible illnesses/ neurological conditions just don’t get the same attention as other, less elusive types of pain. Yes, I often wish that migraines were accompanied by a visually disturbing symptom. Perhaps bleeding from the ears or eyes? Something that really grabs the medics’ attention. If I’m in a very bad state, I loose the ability to swallow properly and end up drooling. But that’s not noticed, especially if you are lying down. Best post, thanks for this one. Everyone should read it. Happy easter my pretties. Thanks for teaching me the art of #pysanky @folkcamp.